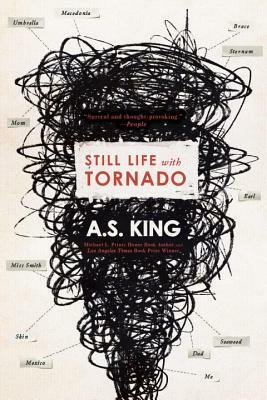 Still Life with Tornado is the eighth novel by American author, A.S. King. Sixteen-year-old Sarah has always loved art, and she’s good at it. But something happened at school, and now she can’t draw at all. And nothing ever happens there anyway, everything is always the same, nothing new or original, so she begins to skip classes. It eventually becomes apparent than an act of theft and wilful vandalism has set in motion an existential crisis. As a truant Sarah wanders the streets of Philadelphia, she encounters other versions of herself: aged ten, then aged twenty-three and later, forty. Conversations with her other selves lead her to recall the events of the family’s Mexican vacation six years earlier, the vacation that triggered her brother Bruce’s disappearance. Sarah benefits from the clear, innocent perspective of her 10 year old self, the cynicism of her 23 year old self and the wisdom of her 40 year old self. King employs three distinct narratives: sixteen year old Sarah relates present-day events, while ten year old Sarah’s account of the Mexican vacation slowly reveals the cause of Bruce’s exile. Helen’s view of her marriage to Chet completes the picture of a family destined for crisis. There’s a bit of magical reality going on (the four Sarahs) but it’s deftly done and not so weird as to be completely bizarre. Watching her ten year old self in the gallery: “I see her looking around for the security guard. I remember being her and thinking ‘just one touch’ as if touching the same thing Picasso touched would give her the talent to become him”. What at first seems to be a book about teen angst goes much deeper: psychological abuse, domestic violence, sexual predators, bullying, homelessness, friendship and loyalty also feature. King skilfully builds her tale, gradually revealing the true situation as her protagonist’s appreciation of the facts develops. Eventually Sarah sees how it really is between her parents: “’Good,’ they say in unison. And then they look annoyed that they said something in unison. Then they fake smile at each other, but I’m starting to understand that smiling is really just another way of baring one’s teeth”. This is a novel that is original and different: it’s clever and thought-provoking, and is bound to have wider appeal than the Young Adult genre in which it sits. Recommended.